Are you a pool shark? 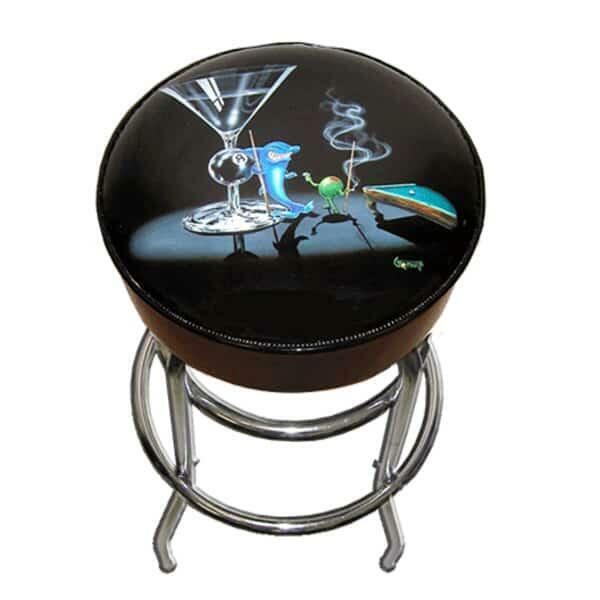 This Bar Stool with artwork by Michael Godard features a scene taken from your local pool hall. A large pool shark can be seen taking money from one of Godard's signature olive characters after a game of billiards. In the background sits a giant eight ball martini glass, a familiar Michael Godard subject. Godard, known as the "Rock Star of the Art World", showcases a fun and unique painting style with Las Vegas and Atlantic City themes such as gambling, bikers and billiard tables, perfect for any game room bar with a nearby pool table or dart board. Combine with the Pool Shark II Bar Stool and the Pool Shark III Bar Stool for a great looking set!